I have been doing a little blog housekeeping. I came upon my previous post "The I Spy Quilt Made it to the Beach" and was surprised by how the pictures in the post did not do a very good job of showing this quilt and all of its wonderful details. I am very proud of it and decided to take a few new pictures to do this quilt justice. Before I could start taking pictures, I had to get permission to borrow it from my 4 year old. I was very surprised by how enthusiastic my son was about this quilt. I have made things for him before and he has always graciously accepted them, but they usually do not get used that much. He immediately connected with it. I joined two "I Spy" charm swaps to gather all the fabrics. 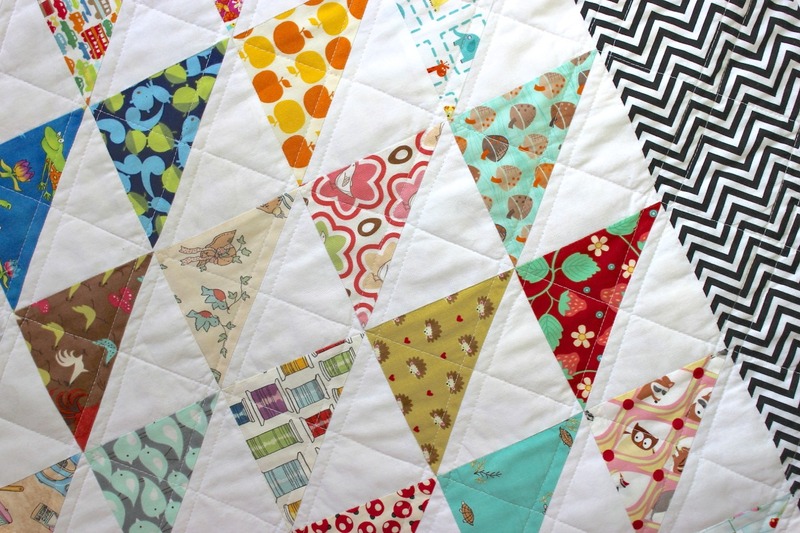 These half square triangles are made using a quick pieced method, so there are two of every fabric. This makes it perfect for not only playing I Spy, but is also great for a matching game. We would even play the games as I was piecing and quilting it. The I Spy Quilt is 65 inches by 65 inches. The border is made with Remix Zig Zags by Ann Kelle for Robert Kaufman and the binding is Dumb Dot in Peppermint by Michael Miller. 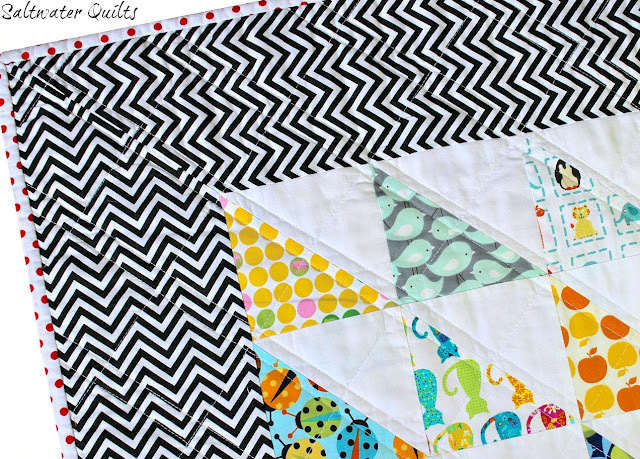 I love how the black and white zig zags show off the colorful fabrics and adds so much energy to the quilt. The Dumb Dot fabric was a fun addition as the binding. 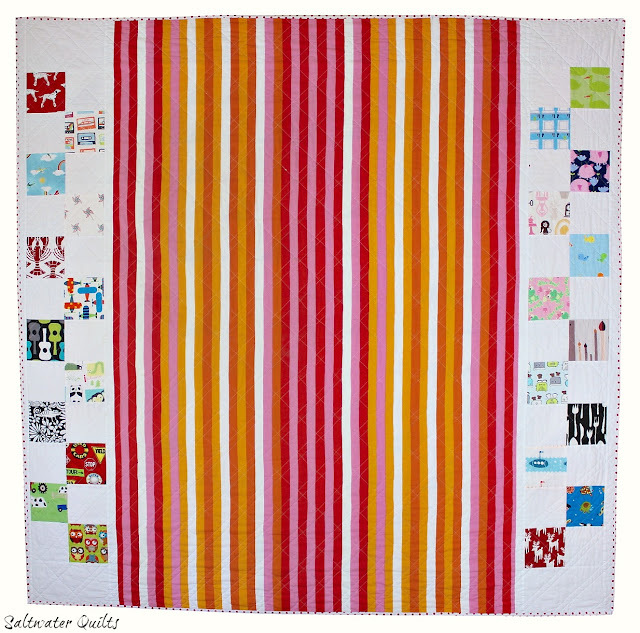 I partially chose it because my son loves red and also because the red helped bring out the warm colors in the quilt. 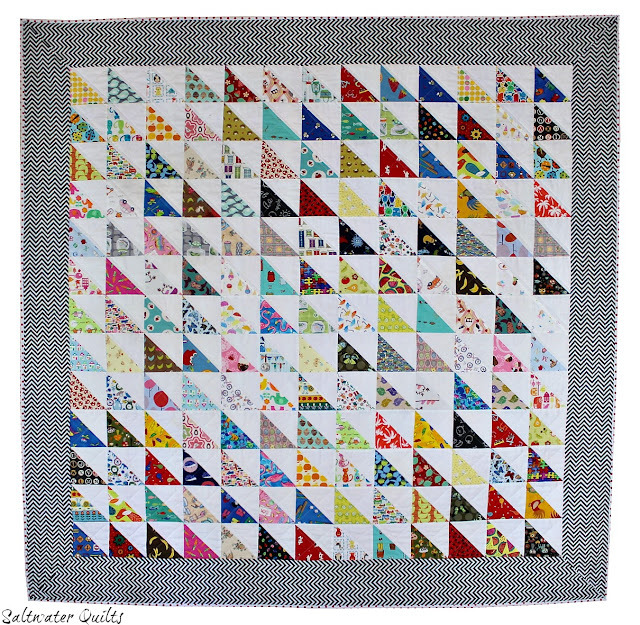 **On a side note - I created an easy mitered corner tutorial for quilt borders as shown in the next picture. You can find the tutorial here - Mitered Corners Tutorial. I am really proud of this quilt. It was so fun participating in the charm swaps and my son and I enjoyed opening the packages and picking out our favorite fabrics. We received so many fun and colorful fabrics. Now I have to say, my favorite part of the quilt is the back. I am obsessed with it. The fabric is a great stripe that I found at Ikea. When I started working on this quilt, I just knew that I wanted to use the stripe on the back along with some of the charms that had larger prints. I love, love, love the back! Some of you are familiar with this quilt, but I just had to share it with you again. I Spy Quilt is Back in Business! The I Spy Quilt Made it to the Beach!! It's a gorgeous quilt, I am not suprised your son loves it! This is so beautiful quilt! I love your quilt. So much that I had to make my own version of it! Thanks for the new pictures. You did such a wonderful job. It's wonderful! What a great border print too! The quilt and the pictures are wonderful! Great quilt--I can see why your son likes it so much, cause I do too! Wonderful that it works for matching as well as I spy! What beautiful fabrics! I love it! I am enthralled with what you do with the backs of your quilts! Pure inspiration ... thanks! An I-spy quilt is on my quilting bucket list. I really like the half square triangle idea with the white contrasting! Now just to pick up more fabric. What a fun quilt! I'm embarrassed to say I participated in a swap and I've yet to make my I-Spy quilt....but I will. No worries, it is great to always have a few projects waiting on you. When you get stuck and can't think of an idea for a new project you can always pull out your waiting pile. That way there is no stressing over what to do next! I really love this quilt! And what fun that your son loves it too! I am here from Find Friend Friday. You make beautiful pieces! Hello Candace! 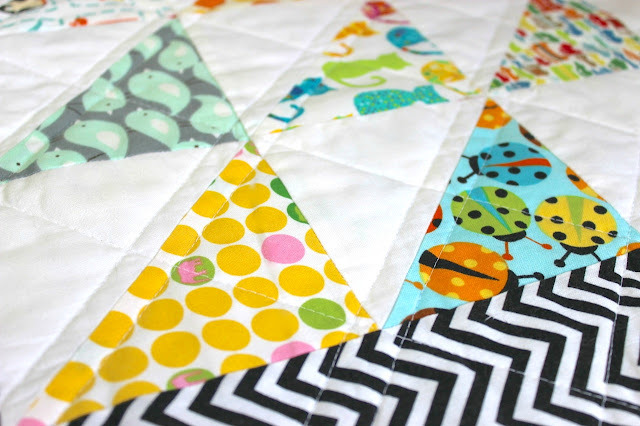 I'm stopping by from Sew Many Ways/FaFF to see your quilt project! I love the way you kept (KISS) the pattern simple in the half square triangles, used the back and white zig zag to set the pattern off! And the back is fabulous! No wonder your son loves it so much! I hope you'll come by and say hello and I would love if you would follow me too! I was so excited that you posted more pictures of this quilt! I have one in progress, your pattern inspired me!! I only hope mine will look half as good as yours! I wish I had gotten in on one of the swaps, I don't have that many fun, modern prints, but I like what I'm using anyways!! Love your blog!! Great! I can't wait to see it. I am sure it is going to be wonderful! I hear flickr is a great place to join fabric swaps if you are still looking for more fabrics. This is absolutely beautiful! And I love that you can play a matching game with it. You were the most clicked link on my link party! I'm featuring this tomorrow! Thanks for linking up! Linking from Sew Darn Crafty. This is so gorgeous. I love it.